Making your own soap at home is easy, frugal, creative, and fulfilling. There's something satisfying about taking a bar of your own homemade soap into the bath or shower with you. Whether you are looking for a more natural alternative to commercial soap or are just a crafty person looking for a new creative adventure, making soap is fun and not too complicated. 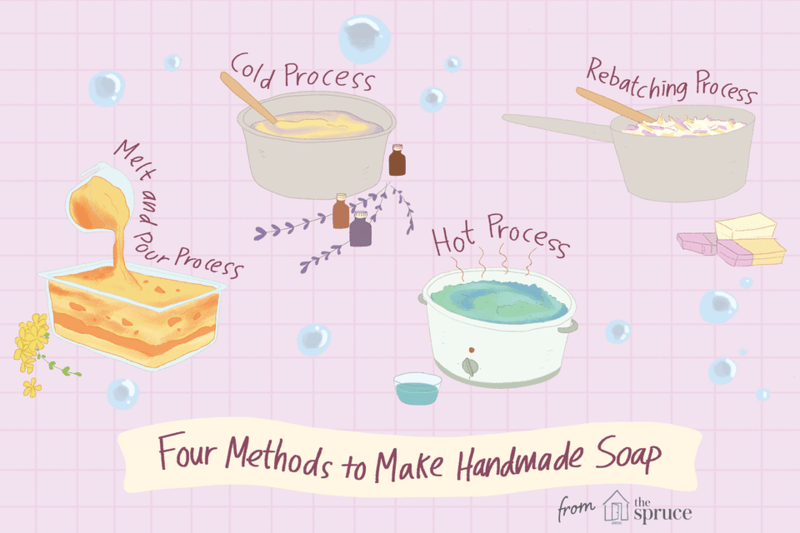 There are several different methods of making your own soap. Once you understand the basics of how to make soap, you can get started right away. Why Make My Own Soap? “Where the hard pastel-colored bars sold at the drugstore are anonymous and indifferent, homemade soap has character. It charms… it smells good… feels good… is comforting in ways which manufactured soap can never be," says Ann Bramson, a pioneer of today's natural handmade soap-making community, in her book, Soap. If you’ve never tried a bar of real natural handmade soap, you’re in for a treat. If you have tried one, and know just how wonderful it is, you’ll be surprised that making your own soap is not as difficult as you think. Soap is the result of a basic chemical reaction between fats or oils and lye. That’s it. By carefully choosing a combination of quality oils, adding your favorite fragrance or essential oils, and swirling in a lively colorant, your soap suddenly takes on that charming character that commercially manufactured soap can’t even begin to compete with. Melt and Pour: A process in which you melt pre-made blocks of soap and add your own fragrance. Cold Process: The most common method of making soap from scratch with oils and lye. Hot Process: A variation of the cold process method, where the soap is actually cooked in a crockpot or oven. Rebatching: A method of grinding up bars of soap, adding milk or water, and re-blending them. Each method has pros, and cons, and variations. Reviewing the two most popular methods, melt and pour and cold process, will help you decide which is right for you. Making soap with a melt and pour base is sort of like making a cake with a cake mix. What you lose in control of your ingredients and customization of your recipe, you make up for in safety, ease, and convenience. With melt and pour soap making, you buy pre-made blocks of uncolored, unscented soap “base” from a craft store or soap supplier. You melt the soap base in the microwave or a double boiler. When the soap is fully melted, add fragrance, color and/or additives. Put it in a mold, and voila, you’re done. The soap is ready to use as soon as it hardens. If making melt and pour soap is akin to using a cake mix, cold process is making your cake from scratch. You control everything that goes into the pot and you can make it as natural as you want. Your setup is a little more complicated and you’ll need to learn a few techniques of the craft first. To make cold process soap, you heat the oils in your soap pot until they’re approximately 100 degrees. Slowly add the lye-water mixture and blend the soap until it thickens to trace. After the mixture reaches trace, you add your fragrance, color, and additives and pour it into the mold. The raw soap will take about 24 hours to harden and about four weeks to cure before it’s ready to use. Whichever method you choose, you can make great soap. Work patiently and follow the instructions closely to start with. Once you’re familiar with the basic steps, you’ll be able to let your creative inspirations flow and make all sorts of wonderful soap creations.